White spots on the body and the fins (the size of a pinhead, 1 mm maximum). 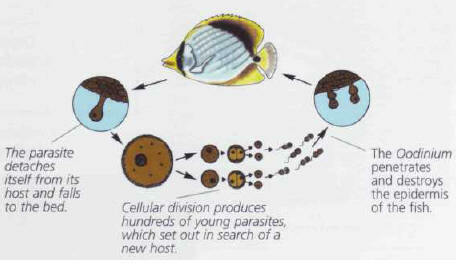 ICHTHYOPHTHYRIASIS Protozoon parasite, Ichthyophthirius. Fresh water. White spots, smaller than the above, forming a fine veil, the fins often stuck, scraping against the decor. OODINIUM. Unicellular parasite, Oodinium, equipped with a flagellate to move around. Fresh water, but above all in sea water. Identical to the above, but with bigger spots. CRYPTOCARYON DISEASE. Protozoon parasite, Cryptocarion. Sea water. White clumps with a cotton-like appearance, foam. FOAM, SAPROLEGNIA. Fungi, including Saprolegnia. Fresh water, rare in sea water. 1 or 2 eyes abnormally swollen. EXOPHTHALMUS. Bacteria, viruses, fungi, sometimes all together. Fresh water and sea water. Swollen abdomen, bristly fins. DROPSY. Mainly bacteria. Fresh water and sea water. Opercula sticking out, unsteady swimming, tiny flukes on the branchiae. GYRODACTYLIASIS. Parasitical fluke, Gyrodactylus. Fresh water. Gasping for air at the surface. Lack of oxygen. Defective aeration, general balance of the aquarium disturbed. Fresh water and sea water. Weight loss, poor growth. Dietary problems. Underfeeding, or lack of vitamins. Fresh water and sea water. Agitation, uncoordinated swimming, unusual behavior. Bad maintenance conditions. Oxygen problems, poor quality of water (especially nitrogenous substances). Fresh water and sea water. Fry with deformed skeletons. Hereditary problem. Genetic origin (the parents). Fresh water and sea water. Increase in temperature, formol, malachite green, commercial medication. Contagious, appears if there is any significant drop in temperature. Copper sulfate, commercial medication. Sometimes difficult to detect at first, common in sea water, contagious. Copper sulfate, commercial medication. It is sometimes associated with small bloody spots; fish can experience breathing difficulties. Salt, malachite green or methylene blue (except in sea water: copper sulfate, commercial medication). The disease's development is favored by wounds. Copper sulfate, commercial medication. Sometimes difficult to treat. Copper sulfate, commercial medication. Contagious, sometimes difficult to treat. Salt, copper sulfate. Not very easy to detect. Increase the aeration, check and adjust the parameters of the water. Gasping for air can also be a symptom of an infectious disease. Fresh food alternated with live prey. Possibility of incorporating commercial vitamin solutions into the food. Increase the quantity of oxygen, cnange one third of the water, check its quality (nitrites, pH). The symptoms can also correspond to an infectious disease. If a lot of fry are affected, there is a genetic problem - the parents, and they must therefore be separated. It is not unusual for a few of the fry in a batch to be affected. 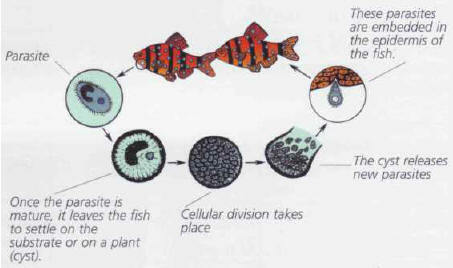 In the former case, the infection is caused by a protozoon (unicellular animal) which alternates its existence between the fish and the water. It is extremely contagious. This disease is particularly likely to develop when there is a drop in temperature, or after the introduction of a new fish. It is treated with commercially available products or with formol. The same conditions also apply to the "foam" caused by fungi, including the Saprolegnia. Its proliferation is enhanced by skin wounds. The treatment is carried out with commercial products, or with either methylene blue or malachite green. This is caused by a unicellular parasite that bears a flagellate, which allows it to move about. It alternates its existence between the water and the fish. This very contagious disease appears when a fish has been weakened, as up to then it was a healthy carrier. It can be treated with copper sulfate or with a commercial medication. ДЕРВИШИ (перс ., букв. - бедняк, нищий), члены мусульманских суфийских братств; в более широком смысле - нищие.